to all ages. We have traditional services. 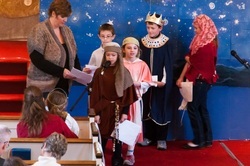 The children join us for the first 15 minutes and then go to their Church School Classes. The Deacons are committed to the care and nurturing of the congregation. We support the prayer chain for spiritual enrichment of our community. We care for those with special needs and nurture relationships among church members, the larger community and other churches in the area. We also run a Food Pantry that is open to all. You may visit the Food Pantry on the 1st Saturday of the month from 11:00 - 12:30, or during the week on Monday & Wednesday from 9:30 - 3:00 and on Thursday from 9:30 - 12:00. You may call the office at 973-728-3081 for more information on the Food Pantry. finances and budget, the annual stewardship campaign and all mission giving opportunities throughout the year. We run an Auction each November to help support the budget. West Milford Presbyterian youth group meets after church on the third Sunday every month at 11:30am. Youth in Junior and Senior High are welcome to attend. 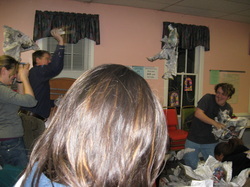 The youth group usually meets for bible study, games and fellowship. In addition to monthly meetings, the group enjoys local trips to do activities such as laser tag and bowling and lock ins. Each summer the group engages in mission by doing a summer work trip either locally or regionally. This summer we will be attending Presbyterian Youth Triennium. given much is required. 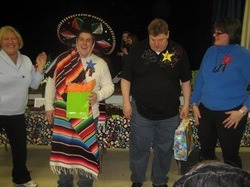 We share our time, talents and treasures both locally and abroad. We support a varity of local missions including , Strengthen Our Sisters, Eva's Village, Habitat for Humanity, Operation Shoe Box, as well as particpating in global ministries through the CROP WALK program, Quilts of Valor, Souper Bowl of Caring. Our youth have gone on many Mission Trips. Nation wide we support the Presbyterian Church , USA unified mission giving through the One Great Hour of Sharing. The property committee is responsible for the ongoing maintenance of our buildings and property. 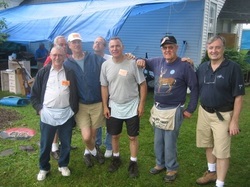 Our Senoir Saints is a group of retired men that meet each Thursday from 9:00-12:00 to do odd jobs around the Church. They share their time, talents, and skill while enjoying each others company. The Congregational Life Committee of WMPC provides the comfort of home for our Church family and beyond. Through planned events we bring people together in the name of Jesus Christ. individual classes. Our curriculum for the Pre-K through the 6th grade is published for the Presbyterian Church (USA) “We Believe” tells the stories of our faith, serving as a basis for understanding who we are and what we believe. We also run a V.B.S. program in the summer this year it will be held on July 8th - 12th starting at 6:00pm. The softball fields locacated behind the church are leased to the Girl's Softball League and are used by permit only. The schedule is managed by West Milford Parks & Recreation (973-728-2860). The fields are closed on Sunday mornings. HIGH SCHOOL GRADUATE SCHOLARSHIP CONTINUING THEIR EDUCATION AND TO LOCAL AND WORLD WIDE CHARITIES.